COLUMBIA, Mo. 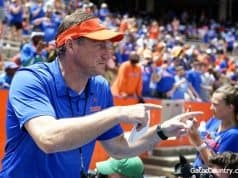 – The fourth-ranked Florida softball team downed Tennessee, 10-2, in a five-inning rout during the Southeastern Conference Tournament semifinal round Friday afternoon at the Mizzou Softball Complex. 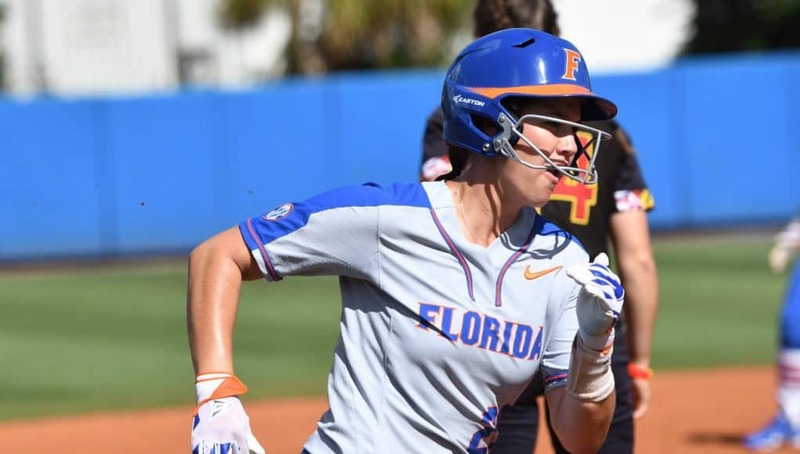 The Gators (49-8) advanced to the SEC Tournament Championship behind a pair of standout performances at the plate by senior leaders Nicole DeWitt and Janell Wheaton. The duo combined for eight of the team’s 10 RBI in the victory over the Lady Vols (45-12). Kelly Barnhill (26-1) picked up the victory in the circle as she only relinquished a pair of runs in the third inning. The Marietta, Ga. native struck out nine on 114 pitches through five innings of work. It was also her 21st complete game of the season. Bottom 1st 2-0 Nicole DeWitt put the Gators ahead with a two-run home run over the wall in right center field. Amanda Lorenz scored on the play after she reached via a walk. Bottom 1st 3-0 After back-to-back walks by Kayli Kvistad and Jordan Matthews, Janell Wheaton found a hole up the middle for an RBI single to score Kvistad for the third run of the game. Bottom 2nd 6-0 DeWitt connected for her second home run of the game and extended the Gators lead after Jaimie Hoover was hit by the pitch and Lorenz reached on an infield error at first. Bottom 2nd 7-0 Wheaton registered her second RBI of the day with a sharply hit double down the left line. Pinch runner Alex Voss scored on the play as she entered after Matthews drew her second walk. Top 3rd 7-2 Ashley Morgan plated two runs for the Lady Vols after a double to the gap in right center. Leach and Poindexter scored on the play but Seggern was out at home on the relay from Hoover to Adams to Wheaton. Bottom 4th 8-2 Wheaton tallied her third RBI of the game as she drove in Lorenz on ground out that deflected off of Moss in the circle to Leach at second. Bottom 5th 9-2 Hannah Adams drove in Jaimie Hoover to start the rally in the bottom of the fifth inning. Hoover drew a full-count walk with one out earlier in the inning. Bottom 5th 10-2 Jordan Matthews sealed victory with her bases loaded RBI single to center field that scored Adams. Kvistad drew three walks in this afternoon’s game against the Lady Vols. 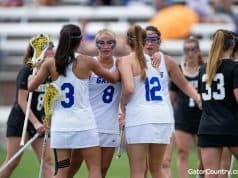 Over her career she has amassed 176 free passes and surpassed former Gator standout Lauren Haeger who recorded 175 during her four years. Kvistad has six walks through two games of the SEC Tournament, which is a new tournament record. The Gators improved to 27-27 in the SEC tournament and will appear in the championship game for the seventh time in program history. o The 27 tournament wins are tied for third most in the conference. o It’s the first time since 2013 that the team has won back-to-back games in the tournament. Head Coach Tim Walton improved his SEC tournament record to 18-9. 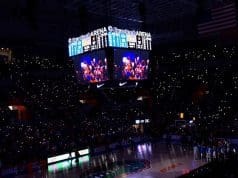 Florida is now 50-26 against Tennessee all-time and 6-5 when facing the Lady Vols at a neutral site. UF struck in the first inning for a trio of runs and have now scored in the initial frame of play 32 times. o The team also scored first for the 44th time this season and now hold a 42-2 record when doing so. Barnhill picked up her 67th career victory and is now tied with Ocasio for sixth all-time in career wins. After this afternoon’s two home runs, the Gators have now had five-straight multi-home run games. o DeWitt hit both home runs and is only the second Gator this season to have a multi-home run game. Lorenz hit two against Loyola Marymount March 1. DeWitt tied her career-high in RBI with five in the game. The Gators advance to the SEC Softball Tournament Championship and will take on No. 12 South Carolina Saturday, May 12 at 8 p.m. (ET) / 7 p.m. (CT) on ESPN2.